At last you can monitor the micro climate at a remote site for as little as $298! 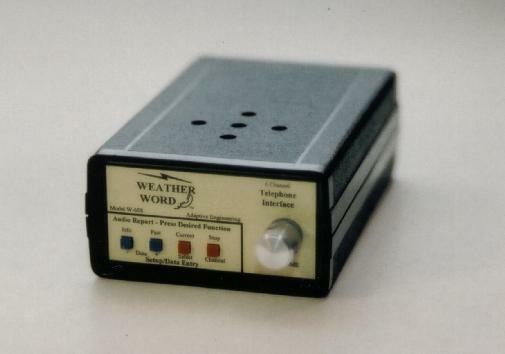 "You’ve reached Weather Word™. At any time you can press three to hear instructions on use. Wind speed average currently is five mph. Wind direction range currently is from minus eight nine degrees to minus eight nine degrees. Precipitation total currently is point oh two inches. Temperature average currently is six seven degrees. Relative humidity average currently is four four percent. Wind speed average one minutes ago was five mph. Wind speed average one one minutes ago was oh mph....."
Barometric Pressure 26" to 32"
Monitors three analog (multi-valued) channels for weather or other signals, also monitors three digital input sources. Security mode tells you the number of calls and time since last reset. It also allows setup changes over the phone! Weather Word and Public Messaging are trademarks of Adaptive Engineering, San Bruno CA. 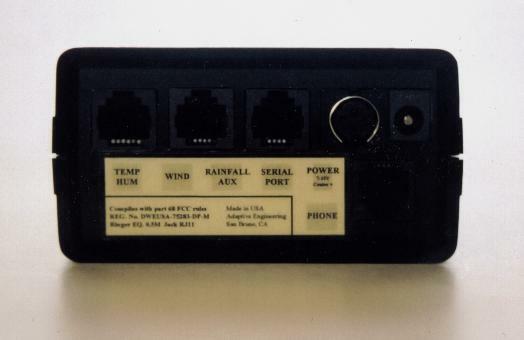 Vantage Pro, Weather Monitor II and Weather Link are trademarks of Davis Instruments Inc., Hayward CA.